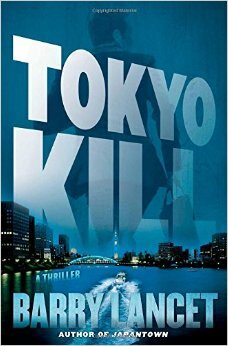 Of course, it doesn’t hurt that author Barry Lancet had years of publishing experience behind him, as well as years of living in Japan before he began writing his Jim Brodie thrillers. He had an insider’s advantage navigating the choppy waters of approach letters, choosing a literary agent, and a clear knowledge of what worked on the page. This and his deep appreciation of Japanese arts and culture must have presented an irresistible formula for writing novels to anyone so inclined. In Lancet’s case, this formula works quite well. His Japantown (2013), Tokyo Kill (2014), and Pacific Burn (2016) are all thrillers that were over much too soon for me. Not only did the narratives move apace, but Brodie and the cast of characters are windows into Japanese life: how we as Westerners are perceived by the Japanese, balancing out there on the Pacific Rim, and how they perceive us as undisciplined and spoiled but good-hearted. In Japantown, we meet Jim Brodie, an art dealer based in San Francisco, who has recently inherited his father’s half of a security firm in Tokyo. We quickly learn that Brodie has grown up in Japan, attending Japanese schools, and learning martial arts in his youth, as well as absorbing his art curator mother’s appreciation of beauty. Brodie’s experiences and expertise in both worlds and in both countries have brought him some international attention on which the San Francisco PD depend when a Japanese family from Tokyo is publicly murdered in the city’s Japantown district. At the crime scene Brodie spots a kanji near the bodies—it looks like the same ideograph he found near his wife’s body all too recently. Brodie has tried to find the origin of the character, but has been told either it does not exist then was sworn to secrecy as to where it had been seen before. By investigating the kanji further he finds himself propelled into an international tangle that he is personally and professionally motivated to sort out, if he and his circle live long enough. For many in Japan, WWII still looms large in their politics and culture but Brodie and his agency are nevertheless surprised when a Japanese veteran and his salaryman son approach them to look into the deaths of two of the veteran’s friends/comrades from the war in Tokyo Kill. The old soldier is certain the deaths are linked and hark back to his time spent in China during the Japanese occupation as the elite Black Wind special unit took cruelty and thievery to new and unprecedented depths. The next death has connections to Chinese gangs, triads, who have long been settled in Japan and who have reputedly curtailed their criminal activities except amongst themselves. Not only does Lancet re-acquaint the reader with the legends surrounding Pu Yei, the Last Emperor of China, but he also ups Brodie’s game by introducing a possible romantic interest if they both survive a fugu dinner. 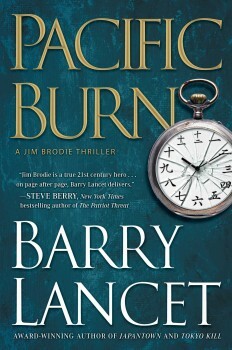 A Japanese artist and his family are targeted by an assassin early into Pacific Burn. Each adult family member has professional and personal enemies, but surely none that would systematically seek to shoot, stab, or poison to eradicate them all. 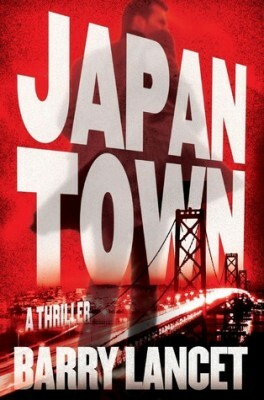 Brodie knows the family well and is therefore pulled into the San Francisco Police Department’s investigation that has its roots in Japan, Washington D.C., as well as San Francisco, and finds himself up against an unbeatable, legendary assassin, “The Steam Walker.” An easily overlooked clue turns the investigation in the direction of the most active volcanic region of the Japanese Islands, Mt. Asana, where Brodie and his team must rely on luck as well as skill to escape assassination themselves. Since the fourth novel in the series is due out in June of this year, Brodie indeed survives and triumphs. My copy is already pre-ordered. Jim Brodie is an intriguing protagonist. He is as involved in the arts as he is capable of defending himself. Each novel in the series offers new insight into Asian art in general and usually Japanese art in particular, but he is no stranger to inside the Beltway and to the ways of lawyers and lobbyists. He knows how to play agencies against each other to survive and to protect his clients. For a man whose life is centered in the arts, Brodie certainly knows his way around the meaner streets here in Asia. Lancet has written a hero who is believable, slightly fallible, and very much a man we would want on our side in any fracas. The books are hard to put down because the action is compelling, and we always learn new and intriguing information, but I think the measure of Brodie as a character is his relationship with his daughter. Raising her is his toughest assignment and the one he loves the most. It has been and will be of great interest to see how this man and this series develops. Sharon Tucker is former faculty at the University of Memphis in Memphis TN, and now enjoys evening supervising in that campus library. Having forsworn TV except for online viewing and her own movies, she reads an average of 3 to 4 books per week and has her first novel—a mystery, of course—well underway. Japan Town was a great read so would love to try this one also! Thanks for offering to us! Certainly, Lynn. I think you’ll find the Jim Brodie’s get better and better.